This page can not load correctly. Please try again in a few minutes, or contact the support. Works in Mac OS X 10.7 or later, Windows 7 or later, and Linux (x86, arm). These instrument packs can contain one or several instruments. A licence of Pianoteq is required to use them. These instrument packs cannot be loaded in the trial version. More information about upgrades is available here. We accept VISA, MasterCard and American Express. Your payment is handled by our secure server at Caisse d'Epargne. Alternately, you can pay with Paypal. Students and teachers in music related courses are entitled to educational discount. Application form here. All products in our online store are delivered electronically. After successful purchase, you will receive a serial number and download link. As a Pianoteq customer, you are offered generous promotion deals from our collaboration partners. Log in to the user area to make use of any of these offers. Leandro Gardini has been composing, orchestrating and arranging for the music industry for the last fifteen years. He has won several awards including the Berlin International Film Scoring Competition 2018. He offers a 12-week course based on recorded video instructions, guiding you step by step how to develop your skills. 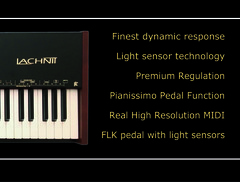 The LACHNIT FLK Keyboard is a high quality MIDI Masterkeyboard, developed with passion and love. Each keyboard is hand crafted, assembled and regulated in collaboration with professional pianists. The patented FLK Hammer Lichtsensorik technology provides you the experience of absolute authenticity and superb dynamics, resembling to real grand pianos. The latest update offers a Pianissimo Pedal Function, triple pedal unit with light sensor technology, and premium regulation of the keyboard. The main developer of the Lachnit FLK keyboard, Fritz Lachnit, has more than 10 years of experience in keyboard development for Bösendorfer where he was in charge of the development of the CEUS reproducing system. 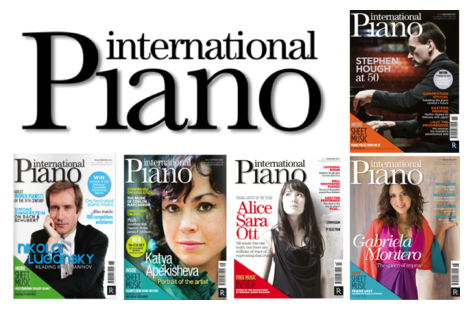 In cooperation with Rhinegold Publishing, we give away a FREE one-year subscription (worth £24.99) of the digital edition of International Piano magazine, written for pianists and discerning fans of piano music. Each bi-monthly issue includes interviews with top pianists and rising talents, performance tips, news, features, analysis and comments. You will find exclusive tutorials by concert artists, in-depth articles on piano recordings and repertoire, masterclasses on piano technique, and festival, concert and competition reports from around the globe. Each issue includes free sheet music – often rare or newly released works. 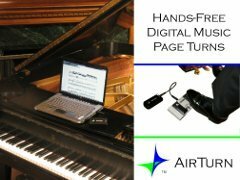 Airturn is an innovative wireless device which lets you turn digital pages with a silent foot pedal so that you can keep your hands fully focused on your piano playing. Perfect for musicians who struggle with bulky gig books and messy sheet music binders, the AirTurn professional bundle includes the wireless AirTurn page turning transmitter, 2 silent foot pedals, and the MusicReader software which, besides working with the AirTurn, lets you scan and convert sheet music from paper scans or PDF files for use on your Mac or PC computer. With PNOscan, you can record music directly on your acoustic piano using state-of-the-art optical sensors that record every key motion with unparalleled accuracy and precision. PNOscan captures the full profile of movement of the key and pedal action over the course of a musical piece, providing a truly authentic recording of the expressive timing and dynamics of the individual pianist. 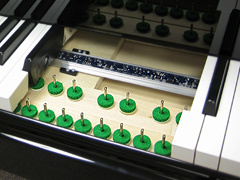 PNOscan can be retrofitted on a piano you already own or factory installed on any new Story & Clark piano.